Night one of Shaina's Sewing School was spent exploring all the presser feet that accompany your machine and all those that can make your sewing life much easier. How many times have you pulled out your accessories and wondered what they are for or you know what they are but have no clue how to use them. My problem is thinking that the time spent figuring out how to use it will outweigh the benefit. BUT I assure you, every time I have have taken the time to play around with with a foot I've never been disappointed. There are learning curves that accompany everything. Shaina demonstrated the various feet and shared some great tips! Above she is showing us the foot used to stitch a button on...YES! no more hand-sewing on buttons! ...and they come with just about every machine. 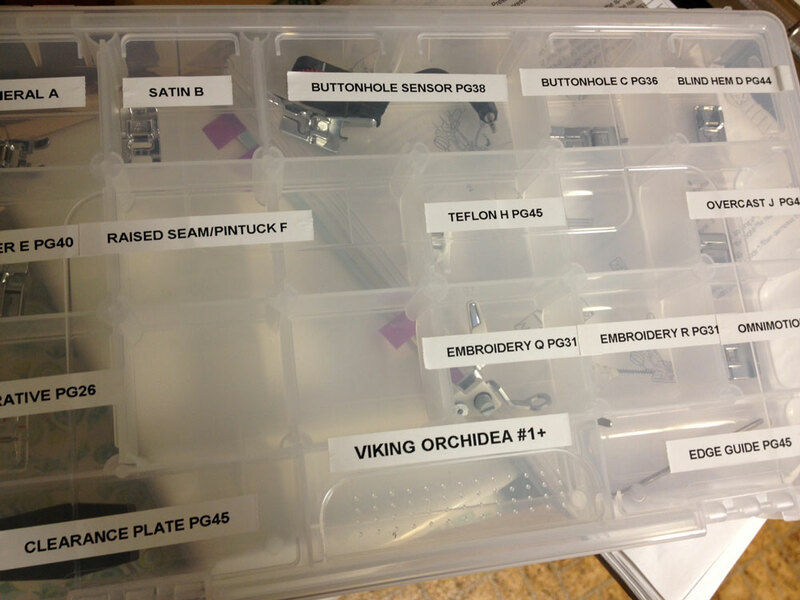 The proper organization of your sewing feet is a sure fire way that you will remember what a foot is for and use it! Shaina picked these boxes up at building supply store. Less than $10 for 3 boxes! If you have more than one machine you can use a separate box for each machine. Notice she's also included the page number from her manual that shows how to use the foot - Genius! Adjustable Hemmer Foot - no need for ironing! A portion of the class was spent hands-on. Several machines were set up and ready to go with a special foot for test driving. Plus, each person brought along their own machine so they could become more familiar with their feet and settings. Next week we will be exploring different threads! There are so many different threads with so many different purposes that give you so many different looks. Learn how to use them with your machine! Sign-ups are still being taken on and individual basis. Check out our website, call or stop in! Valuable information! Any possibility of having these classes again on a Thursday or Friday night or Saturday sometime in the winter?